6/4/2012Share this story on Facebook! 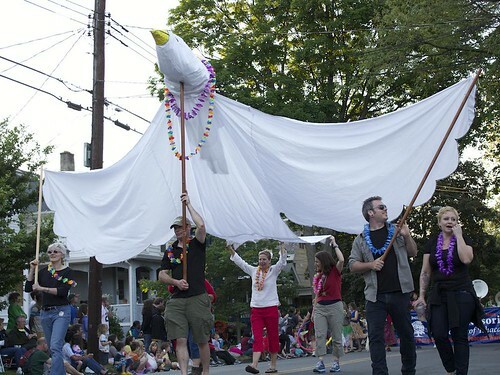 Check out this video for highlights from the Ithaca Festival Parade. 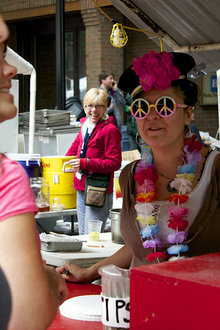 School’s out on the South and West Hills, and that can only mean one thing — it’s time for the annual Ithaca Festival. 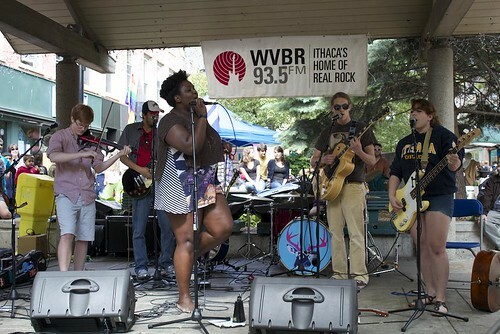 For its 35th year running, this festival is really one that belongs to the city and people of Ithaca — a four-day celebration of local arts, music, food, and performance. With this year’s theme of “Finger Lakes Luau,” there were plenty of grass skirts and Hawaiian leis floating around the Commons. The Ithaca Parade kicked off the festival Thursday night, as locals gathered along Cayuga Street or watched from their front porches as a vibrant display of dancers and musicians processed through the cheering crowd. The parade isn’t your typical procession of public figures and fire trucks. Instead, the young and old from all corners of the city come out to dance in their craziest costumes and wave to their friends. Irish step dancers followed the unicyclists, and stilt walkers wobbled past the Suffer Jets, Ithaca’s women’s roller derby team, who whizzed down the street near the dueling Shakespeare club. Only in Ithaca does parade music include the He Man Chain Saw Marching Band, as the group fired up their chain saws and showed off their "instruments." A set of Volvo sedans — complete with pink tutus — waltzed through the street, while actual dancers showed off their moves through the cars' open sun-roofs for the parade's infamous "Volvo ballet." Just as the annual festival is a tradition in itself for native Ithacans, so is the probability that rain will threaten at least one day of the weekend. This year was no different, but the occasional showers didn’t keep the music down or the crowds away. With nonstop music spread throughout more than six stages downtown, it wasn’t easy to choose which local rock, folk, jam, or jazz bands to see. Then, there’s the food. State Street never looked so scrumptious. This weekend, it was packed with festival food vendors, selling everything from homemade potato pancakes and pulled pork to hot corn on the cob and unlimited refills of locally brewed root beer. Crafters lined Cayuga Street selling a variety of homemade jewelry, clothing, and household items, while Dewitt Park was brimming with games, balloon animals, and science experiments for younger kids. Though the Commons is typically bursting with activity during Ithaca's signature Apple and Chili festivals during the school year, there's something about the Ithaca Festival that is bigger, quirkier, and funkier than the fall and winter fairs. With endless music, art, and food options for four days, this is the chance to celebrate what it means to be truly Ithaca.